Managers, supervisors, safety professionals, and employees who participate in safety functions will find McSween’s book to be an essential working reference. They will learn how to develop processes that dramatically improve safety, boost worker morale, reduce on-the-job injuries, and strengthen any company’s bottom line.
. . . a very practical book that clearly illustrates how to apply behavioral technology to improve safety in the workplace. This book is brilliant in its practical approach . . . it belongs on every safety professional’s desk. 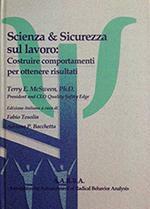 Terrry McSween, Ph.D. is CEO/President of Quality Safety Edge (QSE). Considered one of the world’s leading authorities in behavior-based safety, Terry has 30-plus years of experience consulting in educational, institutional, and business settings. He is the recipient of local and national awards for his work in behavioral safety and is actively involved with a number of business and professional organizations including the Board of Trustees for the Cambridge Center for Behavioral Studies, the Association for Behavior Analysis, the American Society for Safety Engineers, and the Texas Association for Behavior Analysis. A speaker at safety conferences worldwide, Terry also founded the annual Behavioral Safety Now Conference (BSN). He has published over 100 articles and authored the seminal book on behavior-based safety: The Values-Based Safety Process: Improving Your Safety Culture with Behavior-Based Safety. Free domestic shipping in the United States via USPS 2nd day Priority Mail. For other shipping options, including international shipping, or to check your order, please contact Liza Johnson at 843-697-2234 or email.